Zespri International, the world's largest marketer of kiwi fruit, faces some significant challenges, including rising costs of all sorts of consumer goods and direct competitors selling at significantly lower prices. Yet Zespri successfully markets some of the most expensive produce products in North America, thanks in part to messaging from a regional communications team that emphasizes the product's quality and relative bang for the buck in terms of nutrition. 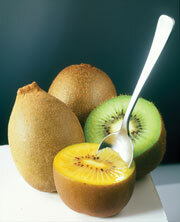 For instance, the fruit might be relatively small in size, but it contains twice the vitamin C of an orange and the same amount of potassium as a banana, as well as fiber content comparable to a bowl of bran, notes Karen Brux, Zespri North America market manager, who oversees the marketing of kiwi fruit in the US, Canada, and Mexico. "Zespri has always focused on communicating a healthy lifestyle," she says. "Our tagline is 'nourish and flourish.'" The fruit is typically available in stores from May to November, but consumer PR efforts begin in December with outreach to long-lead media, including health and lifestyle publications, while direct promotion to retailers starts in March. Strategies that deliver particularly good results often prompt the company to adjust allocation of effort and resources from year to year. For instance, the gold kiwi, which is more expensive than Zespri's green variety, has been successfully marketed to the Asian community throughout Canada and the Pacific Northwest, with sponsorships of local events like the international Dragon Boat Race in Toronto. Due to the success of such outreach, Brux might curb those efforts for the upcoming year and instead focus on a different region with the Asian demographic or a separate demographic altogether, like the Hispanic market. "We focus on markets for a few years, and when those are mature and don't require as much support, we focus on other [ones]," she explains. "We always say we're market- driven, not orchard-led. We always do what's most appropriate for our market. [And] as a grower-owned company, we're always aware that we're responsible for their income and look to sell the maximum amount of fruit at the highest return possible." Along with a marketing team consisting of 250 people worldwide in offices from Japan to Europe, the company recently hired a global marketing staff and is reviewing how best to coordinate its communications efforts around the world. Messaging about the brand is overseen by Lauchie McLean, branding and marketing director, who also oversees the Australian market, but market leaders for each region determine what strategies best tap their relative markets. Zespri US, for example, is starting to position the fruit in the context of lifestyle PR with the support of AOR Publicis Consultants. Andrea Clark, Publicis SAE, says that creates opportunities for viral messaging. "The lifestyle approach is to make kiwi a healthy part of everyday thinking, through recipes and ideas that can be replicated," she explains. As part of this effort, Zespri Kiwi partnered with Big City Moms, a New York social network with more than 12,000 members, to reach mothers through events and a strong presence on the organization's social networking site. "This is the first year we've taken more concrete steps into the lifestyle arena," Brux says. "And it's a direct result of me becoming a mother, joining a mom's club. [First-hand], I learned the power of these networks where hundreds of thousands of women are focused on providing their families with the best choices." Along with a regionalized lifestyle program targeting goal-setting moms who seek to integrate healthy foods into their children's diets in a fun, practical way, Zespri promotes its fruit during the summer to retailers and the media through road shows hitting key markets such as New York, Seattle, Baltimore, and Chicago. "It all comes down to branding," says Brux. "Maybe, our product is more expensive, but we offer a consistently great eating experience for [our] customers and have promotions in place to make sure [our consumers and retailers] know our brand."